Sen. Maria Cantwell stopped by the Columbia Springs environmental center in Vancouver Aug. 3 in order to urge support for a bill that would allow for state and tribal officials to remove predatory sea lions far up the Columbia River watershed in order to protect threatened fish populations. Cantwell is a co-sponsor to Senate Bill 3119, primarily sponsored by Democratic Idaho Sen. Jim Risch, which makes changes to the current Marine Mammal Protection Act to give wildlife managers the ability to apply for a permit allowing removal of sea lions more than 112 miles upriver from the ocean or in spawning tributaries for certain salmon and steelhead populations. Cantwell said earlier that week the Senate Commerce Committee had passed the legislation to the Senate floor. The legislation is a companion to House Resolution 2083, a similar bill that is sponsored by Rep. Jaime Herrera Beutler, R-Battle Ground. 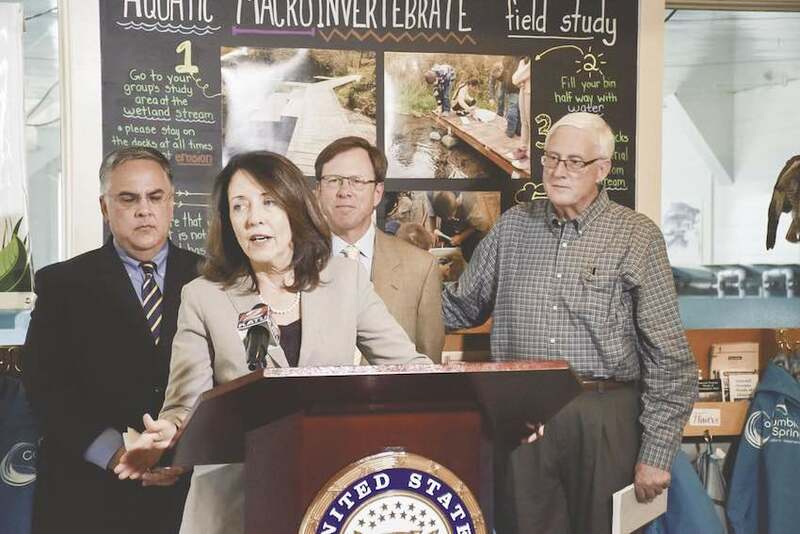 Speaking alongside Cantwell were several officials, both from organizations focused on healthy water ecosystems as well as leaders of tribal nations impacted by declining salmon populations. Rahr said that at the Bonneville dam, close to 150 miles upstream from the Pacific Ocean, there were about 150 sea lions in the area preying off of the fish. He added that 43 percent of this year's spring Chinook salmon run was intercepted by the mammals which was unsustainable for the fish population. In some cases, places like Willamette Falls now have dozens of sea lions where there never used to be the animals, Rahr mentioned. The proliferation of predatory sea lions has become "an absolute crisis," he said. "If we don't free up the fish and wildlife managers to deal with the proliferation of the harvest that the sea lions are driving on these salmon and steelhead stocks, we're not going to have fish. We are going to have extinction of the populations," Rahr said, adding that it wasn't likely those populations would ever return once gone. Rahr said it wasn't sea lions as a whole that were the issue, rather the 2,000 or so animals that have been around certain choke points. "This is not a cull. This is a targeted management of problem animals," Rahr said. Current State Salmon Recovery Funding Board and former Lower Columbia Fish Recovery Board member Jeff Breckel also spoke, noting that there were many aspects that went into helping the salmon populations while reinforcing the need for the legislation. "Why do we invest millions of dollars in restoring habitat if we can't get an adult fish up there to spawn?" Breckel remarked. "This (legislation), while itself is not a silver bullet, it's an important contributor in terms of getting this job done." Confederated Tribes and Bands of the Yakama Nation council member Virgil Lewis said growing up he did not see a single sea lion in the waterways he fished -- those who have made it up the Columbia, in some cases nearly 150 miles to the Bonneville Dam, have learned that behavior over time. "If we remove the sea lions that have learned to practice predation of the fish that are many miles upstream where the fish are defenseless, we will be helping (the fish)," Lewis said, "especially the spring Chinook salmon which are so essential to the culture, diet and livelihoods of the Yakama people." "If this predation continues to increase, our efforts to recover endangered and threatened salmon will become even more compromised," Cantwell said. She mentioned how the diet of sea lions more than 112 miles from the ocean was one that consisted of almost entirely salmon, something atypical for the animals. Cantwell said there was very limited time to get the legislation passed. She acknowledged that there would be more work needed to be undertaken to assure a healthy salmon population, but stressed that the science showed dealing with sea lions was an important step. "This act is one piece of a larger effort," Cantwell said. "We have to have all the tools that we need to meet this challenge."